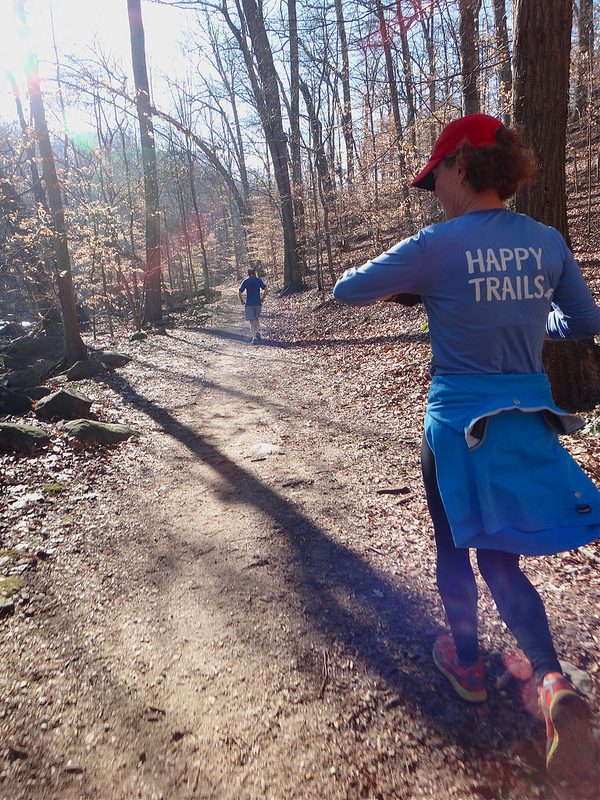 A couple of weeks ago I received an email from my friend Kirstin, aka Ultrarunnergirl, inviting me to go trail running with her in Rock Creek Park. Her timing could not have been better, as I had just been lamenting my “story of sameness” and the need to mix it up with other activities this year. I immediately responded yes. Even though I do some road running, I seldom run trails and have never done so in Rock Creek Park, which is an easy five-mile ride from my house. 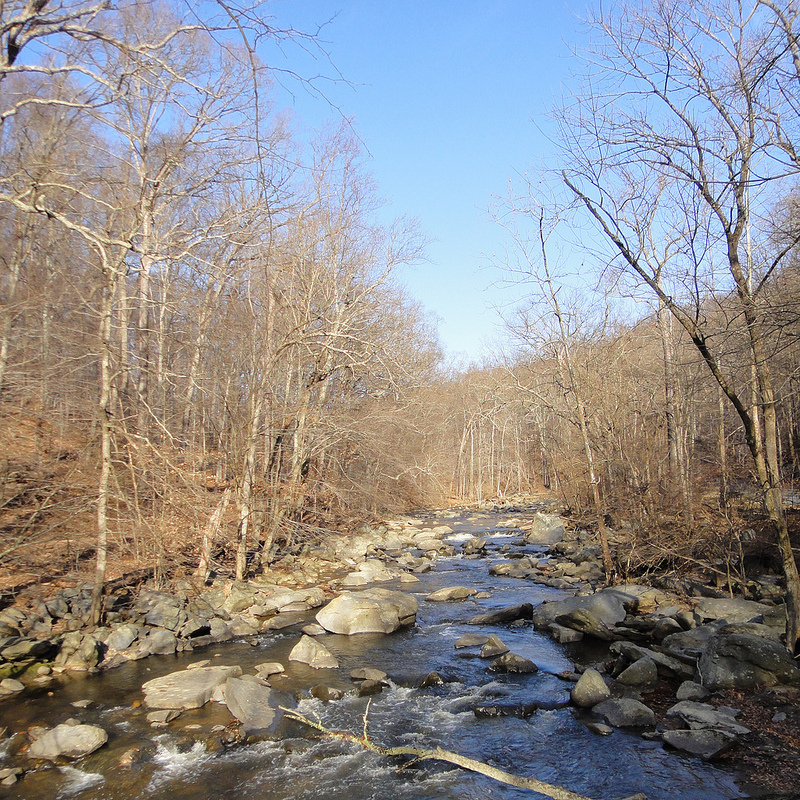 Rock Creek Park is a popular urban park nestled in the middle of Washington, D.C. Even though I have ridden my bike plenty of times through Rock Creek (the main road is closed to vehicular traffic on weekends, making it a weekend haunt for some of the local cyclists), I had no idea what lay beyond the pavement. I had spied some of the trails from the main road, but had no idea where they went. Given my poor sense of direction, I stuck to the pavement whenever I visited Rock Creek. I did not want to end up lost in the middle of the city. Until last weekend, that is. Ultrarunnergirl graciously guided me off the pavement into this urban oasis. According to the National Park Service, the park is technically about three square miles, but it seems to expand once you enter it. Bigger on the inside, a Dr. Who fan might say. I don’t know how the national parkland is measured, but I’m pretty sure that the amount of overall green space we call Rock Creek is significantly larger than the three square miles cited by the Park Service. Trails abound in Rock Creek. They twist throughout the park and converge with each other only to wind away again. The terrain was rolling throughout our run, more than I anticipated. I did not summit any mountains during my outing with Ultrarunnergirl, but my legs told me that I climbed a few real hills. The paths were not overly technical, which allowed me to follow Ultrarunnergirl’s footsteps without too much trouble. Strategically placed stones made creek crossings manageable, and I am happy to report that I did not fall once. It was an odd feeling that a place so known to me was simultaneously foreign. 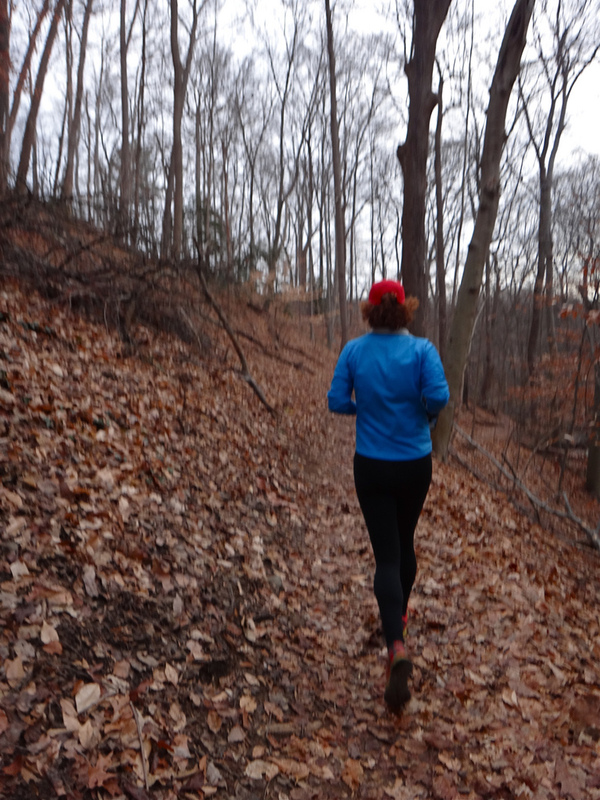 Running the trails in Rock Creek was something like going down the rabbit hole and emerging in an urban Wonderland. Kirstin was an ideal guide. She slowed her pace so I could keep up with her. She explained how the trails worked and interconnected. She routed us over a comfortable distance so that I felt like I had a great run, but was not uncomfortable or physically hurting at the end. There’s nothing better than a friend who says “we should do blah blah blah sometime” and then follows through so that you both actually do it. I felt so happy about discovering a new place in the city and for trying something new. It was a beautiful day to be a runner, and I look forward to my next visit to the Rock Creek trails. Thanks for being my trail guide and taking me beyond the pavement, Ultrarunnergirl! It was my pleasure! You are wonderful company and it made me very happy to be able to show you some of my favorite trails. Let’s do it again soon! Excellent story of a great moment. Sharing an experience like that is one of the treasures of an active life.